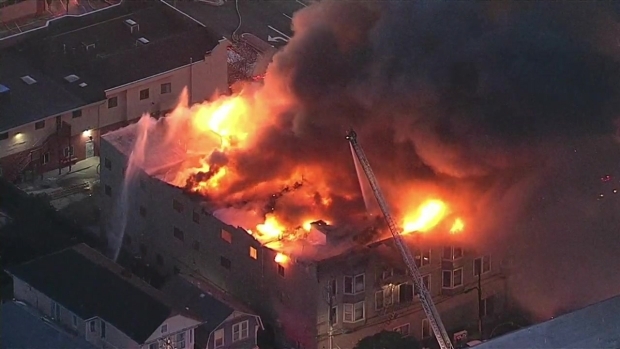 A fourth victim on Tuesday was pulled from the destroyed Oakland apartment building that caught fire Monday morning, and officials were still trying to determine the cause of the massive blaze, according to the Alameda County Sheriff's Department. Four people on Tuesday remain hospitalized as a result of smoke inhalation after heavy flames and thick smoke engulfed the building, which documents show was in violation of multiple fire codes and other rules. The Alameda County Coroner's Office on Monday identified one of the victims as 64-year-old Edwarn Anderson, of Oakland. The sheriff's office on Tuesday identified a second victim as 50-year-old Cassandra Robertson. The two other victims have yet to be indentified. Fire crews on Tuesday continued to knock down hot spots flaring up. Officials were still trying to determine what caused the deadly fire. "Whenever we have a loss of life, as well as so many vulnerable people displaced from housing, it is a tragedy," Mayor Libby Schaaf said. The massive blaze, which was reported around 6 a.m. at 2551 San Pablo Ave., triggered "multiple rescues," fire officials said. 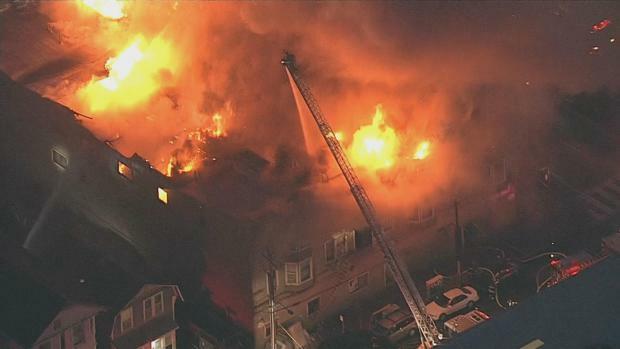 A total of 15 people were plucked from the burning building, which is believed to have housed more than 80 people, according to Oakland Fire Department Battalion Chief Eric Logan. Several people were hanging out of windows when first responders arrived, fire officials said. "I just heard screaming and breaking glass, sounds of wood breaking and explosions," resident Kirstin Evans said after walking away from the blaze. "I looked at my window, and it was all orange and yellow. I ran out of my apartment, and it was all smoky and debris was all over the place." Evans told NBC Bay Area that the fire may have been caused by a burning candle in a residence on the second floor of the building. DOCUMENTS: Complaint History of 2551 San Pablo Ave. 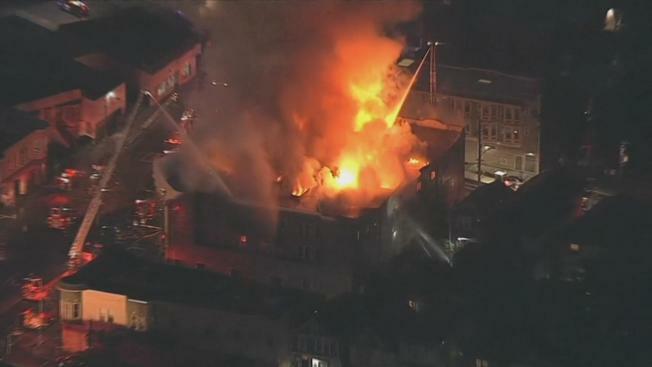 Heavy flames and smoke spew from a building in Oakland. The fire broke out in the rundown neighborhood nearly four months after a warehouse called the Ghost Ship, only about five miles away from Monday's blaze, caught fire and killed 36 people attending an unlicensed concert. The fires have raised questions about the use of some buildings in the city for residences amid a shortage of affordable housing in the San Francisco Bay Area. In 2010, Oakland allowed the owner of the 40-unit building that burned Monday to convert the structure into transitional housing for recovering drug addicts, people struggling with homelessness and others, records show. Since then, it has been the subject of several building department citations and investigations. The NBC Bay Area Investigative Unit has been looking into the history of the building that caught fire Monday morning and found the City of Oakland knew about some unsafe and unsanitary conditions at the property. Investigative Reporter Liz Wagner reports. City records show the building had more than 20 code violations dating back 17 years. The code violations ranged from mold to electrical issues, according to city records. 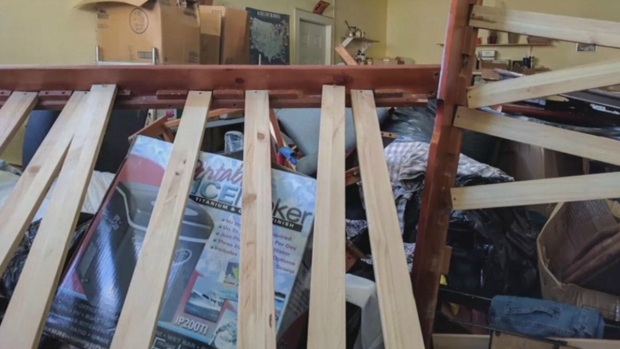 The owner, Keith Kim, was sent a notice of violation on March 2 over complaints of large amounts of trash and debris, building materials and furniture behind the property. During a Friday inspection, just days before the fire, officials found the building lacked fire extinguishers, smoke detectors in every apartment and a working fire sprinkler system, among other violations, documents released by the city of Oakland show. Inspectors ordered the owner to immediately service the fire alarm and fire sprinkler systems. The building department also has an open investigation into complaints of "no working heat throughout the building, electrical issues and a large pest infestation," city records show. The Oakland Fire Department did not respond Monday to a request for inspection records involving the building, and Kim did not return telephone calls from The Associated Press. Days after the December fire, the owner of the building that burned Monday sent an eviction notice to Urojas Community Center, which had leased and occupied the first two floors of the three-story building, said James Cook, an attorney for the center. The community center assists about 60 people with transitional housing and services, Cook said. He had complained to the city about clogged toilets and disgusting bathrooms, exposed wires and water an inch deep on the ground floor, he said. "These people didn’t have to die," Cook said. "The landlord was using the Ghost Ship fire as a reason to evict them. And it's suddenly convenient that the building is now on fire. It's like Ghost Ship, but worse." Residents said the hallways were cluttered with trash and debris. "There were no sprinklers or fire extinguishers," said Curtis Robinson, 52, who had to leave his wheelchair behind in his first-floor room in the scramble to escape. 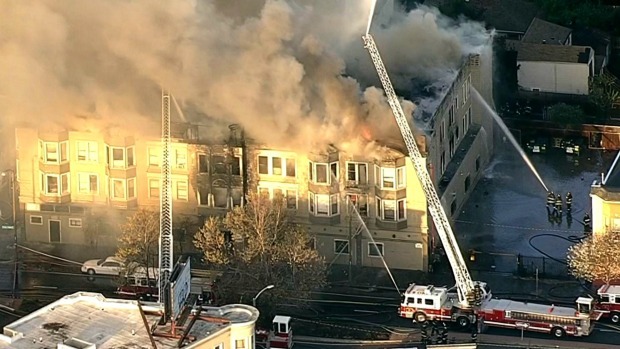 Crews on Tuesday continue to search for a missing person after a four-alarm blaze ripped through an Oakland apartment building Monday morning, officials said. Pete Suratos reports. City Councilwoman Lynette Gibson McElhaney said the entire community is heartbroken by the loss. "It’s extremely difficult for those who have lost loved ones, and I think it’s extremely difficult for the families who are barely surviving here to have lost there homes and all of their possessions," she said. The Red Cross and the Salvation Army were helping people with meals and a place to sleep Monday night. Donations: Anyone who would like to make a donation to help victims, checks can be made out to the "Mentoring Center Care of West Oakland Fire." Details can be found at mentor.org. Home Fire Relief: Anyone who would like to make a monetary donation to help victims in Monday's fire should contact the Red Cross at RedCross.org. Check the option "Home Fire Relief" and note in the comments that your gift is earmarked for services to support families impacted by the 2551 San Pablo Ave./Mead Ave. fire in Oakland, CA. NBC Bay Area's Michelle Roberts and Jean Elle and the Associated Press contributed to this report.